It’s unbelievable what people will do in their pursuit of money. On Deutschland86 Season 2 Episode 3, the money being pursued by the different characters and organizations is nothing more than blood money. There’s an incredible scene in “Dragon Rouge” when a briefcase full of thousands of one hundred American dollar bills rains down on the oil refinery soldiers which eventually turns into a bloodbath where everyone dies in the melee except the one guy who caused it all: Gary Banks. 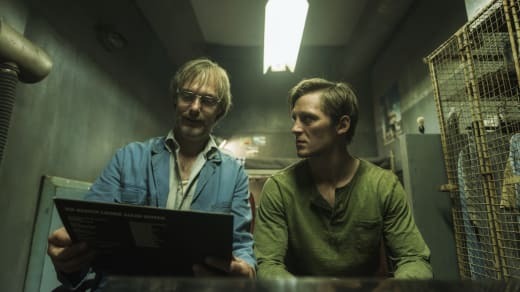 Exquisitely shot and edited, that scene connects all the storylines running through Deutschland86. East Germany is desperate to keep itself and its ideology alive by any measures, even if it means consorting with the very people they claim are their enemy — the West. They’re not getting any money out of the weapons deal Martin and Lenora were trying to make because the weapons are now in the hands of the “wrong” side. 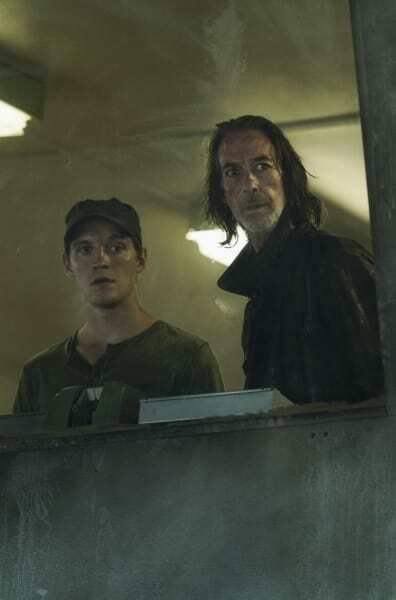 Related: Deutschland86 Premiere Review: Martin is Back!! They’re considering buying the old The Love Boat cruise ship to smuggle even more weapons to sell to willing buyers, no matter who they are as long as it brings in cash. And their drug studies, for which they’re barely getting paid anything, are killing their own citizens. Right now, East Germany has its head in the sand, but more and more people on the inside are starting to open their eyes. What they’re not realizing because they only see their particular piece of the puzzle is that every nation has its hands on the blood money. There is no right side or wrong side because everything is muddled together. Perhaps the only one who might even have an inkling of this is Martin, but we’ll get to him in a bit. How much are the West Germans paying our government to do their dirty work? How much blood money for our guinea pigs? Tina Fischer started to question whether or not the drug studies were humane as several of her patients began suffering from severe side effects, and one even died. While she went along with the program initially because that’s what you’re supposed to do, she’s started to realize that what they’re doing to her patients is horribly wrong. Even if she didn’t get a talking to from Annett (who is clearly out of her mind) and get suspended, she would have chosen to leave the hospital. She put herself at risk by even bringing up concerns, and the fact that her brother Thomas is an anti-Apartheid activist in West Germany didn’t do her any favors. It’s clear that closed-minded Annett and the doctor in charge believe she’s being influenced by Thomas even if they didn’t come right out and say it. Tina isn’t going just to go home and do nothing, either. Somehow she’s going to try to put a stop to what’s happening. The only way this can happen is if she can get to West Germany and get her brother involved. If she tries to fight from the inside, she’s going to disappear. Who knows? Maybe Annett will try to kill her. Annett is crazy and devout enough to go to that extreme. Tina: I swore the Hippocratic Oath. A commitment to my patients and to myself. Annett: A commitment takes precedence over all others? Precedence over the hundreds of East German citizens who suffer from COPD? Precedence over progress? Over Socialism? Tina is trying to protect her patients. Annett is trying to protect her ideals and way of life because that’s all she knows, and anything that goes against what’s ingrained in her is wrong. It’s a cult-like mentality that will be tough to break. It could be that Martin will try to recondition her at some point, but right now she’s hopeless. 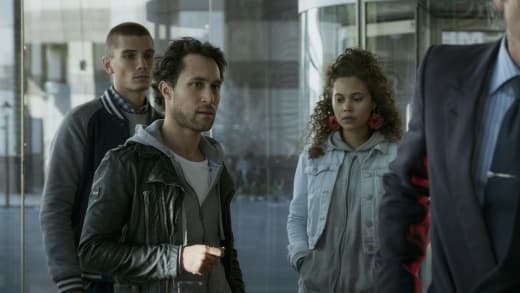 In my review of Deutschland86 Season 2 Episode 2, I complained about Alex’s storyline not fitting in with the rest of the story. I was wrong. His story ties together beautifully with what’s happening with the drug studies storyline. He’s upset that more isn’t being done to find a cure for AIDS when it’s killing thousands of people all over the world, some of whom he deals with every day in his work at the AIDS hospice. Nasal spray. Pain meds. Everything. And instead of finding a cure for AIDS, they spend their money on these stupid posters. He knows that drug manufacturers like the one Mr. Amend works for are testing all sorts of drugs (like those that Tina administers) while ignoring AIDS victims. Alex has always wanted to be part of something, and the AIDS movement might be his big moment. This issue hit close to home and is something more meaningful to him than when he was in the army protesting Pershing missiles. But he can’t confront Amend with only two people by his side, so he’s going to have to figure something out. I’m guessing that somehow he’s going to connect with Tina, and everything will blow up from there. Martin had a lot to deal with on his side of the world. He and everyone else at the refinery did almost blow up, but whoever made that bomb did a piss poor job, and nothing happened. But by that time, almost everybody was dead anyway except for Steinbrecher who was living in his isolated bunker oblivious to everything going on around him — sort of like his East German counterparts. It was a surreal moment for Martin when Steinbrecher put the record on and told Martin that he had enough provisions to last months with no concern about the possibility of the toxin tank exploding and killing everyone around for miles. All of these little incidents are helping to define who Martin is, what he’s all about, and what he wants to be all about, too. There’s a lot of historical information to digest on Deutschland86 that is sometimes hard to understand because it was so long ago. If you’re not a history buff, some of this stuff might go over your head. My recommendation is to watch The ’80s on Netflix. It helped me piece together so much of what is happening on Deutschland86 and made me appreciate even more what the Wingers have done with this show. We finally learned what happened to Alex’s father. 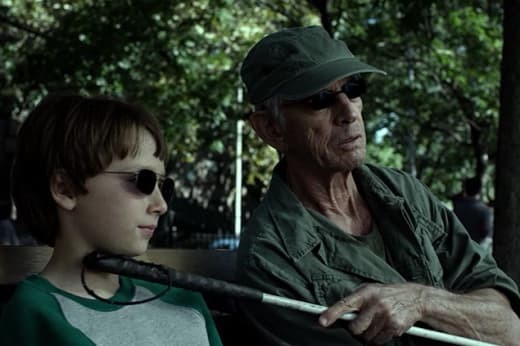 It was a surprise to learn that Alex had accidentally shot him and left him paralyzed, but there’s a possibility Alex might not be telling the whole truth. Gen. Edel wasn’t happy that his son was gay, and I can’t imagine that any parent would want to witness their child trying to kill themselves, but Gen. Edel was outside, and Alex was inside, so I’m unsure of how the General would have tried to wrestle the rifle away from Alex. It could be that Alex purposely shot his father, but we may never know. Roberto hugging Martin gave me all the feels, but Roberto was right to be angry with Martin. He should never have abandoned him. Shame on Lenora for leaving her nephew near death, but she’s going to be waking up sooner rather than later. The whole weapons incident has shaken her. Even Martin can’t resist taking a fistful of the blood money, but at least he shared. It makes me wonder what they’re saying about American involvement in all of the incidents. Is America funding the bloodlust? Walter calling the cruise operation Operation Love Boat is ingenious on his part. He just turned his love of something illegal into a potential illegal cash cow for the East Germans. I can’t begin to express how much I love this show and wish more people would watch. It’s intelligent and thought-provoking, but it’s also highly entertaining. What did you think of “Dragon Rouge”? Don’t forget Deutschland86 Season 2 Episode 4 airs tomorrow at 12/11c on Sundance and will continue with the Friday/Saturday early am showings (or Thursday/Friday pm airings, depending on where you live) until the end of its run. If you can’t watch it live, DVR it — it’s worth it!